ClassDojo the popular "web 2.0" site for managing classroom behavior has just released a highly anticipated update, 'class sharing'. This update allows for teachers to share feedback w/ other teachers about students behavior. More from their press release, "With this newest feature, several teachers in one school can now collaborate around a class of students to deliver consistent experiences that emphasize building positive behaviors and character strengths like like participation, hard work, persistence, curiosity, risk-taking, and helping others. 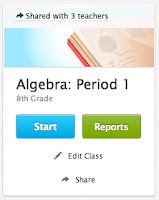 Teachers can now let other teachers provide feedback to their students by giving them ‘full access’ to the class; alternatively they can provide each other ‘view only’ access if they just want to share progress reports." I highly recommend checking out ClassDojo by clicking here! !